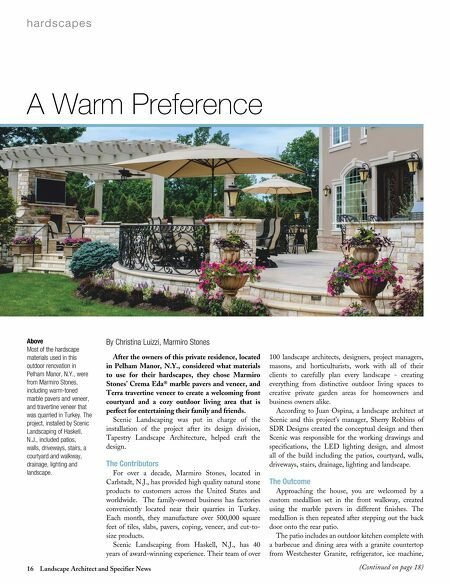 (Continued on page 18) 16 Landscape Architect and Specifier News After the owners of this private residence, located in Pelham Manor, N.Y., considered what materials to use for their hardscapes, they chose Marmiro Stones' Crema Eda® marble pavers and veneer, and Terra travertine veneer to create a welcoming front courtyard and a cozy outdoor living area that is perfect for entertaining their family and friends. Scenic Landscaping was put in charge of the installation of the project after its design division, Tapestry Landscape Architecture, helped craft the design. The Contributors For over a decade, Marmiro Stones, located in Carlstadt, N.J., has provided high quality natural stone products to customers across the United States and worldwide. The family-owned business has factories conveniently located near their quarries in Turkey. Each month, they manufacture over 500,000 square feet of tiles, slabs, pavers, coping, veneer, and cut-to- size products. Scenic Landscaping from Haskell, N.J., has 40 years of award-winning experience. 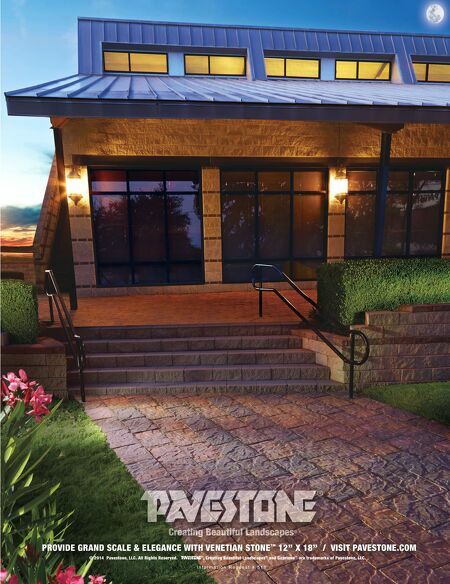 Their team of over 100 landscape architects, designers, project managers, masons, and horticulturists, work with all of their clients to carefully plan every landscape - creating everything from distinctive outdoor living spaces to creative private garden areas for homeowners and business owners alike. According to Juan Ospina, a landscape architect at Scenic and this project's manager, Sherry Robbins of SDR Designs created the conceptual design and then Scenic was responsible for the working drawings and specifications, the LED lighting design, and almost all of the build including the patios, courtyard, walls, driveways, stairs, drainage, lighting and landscape. The Outcome Approaching the house, you are welcomed by a custom medallion set in the front walkway, created using the marble pavers in different finishes. The medallion is then repeated after stepping out the back door onto the rear patio. The patio includes an outdoor kitchen complete with a barbecue and dining area with a granite countertop from Westchester Granite, refrigerator, ice machine, h a rd s c a p e s By Christina Luizzi, Marmiro Stones A Warm Preference Above Most of the hardscape materials used in this outdoor renovation in Pelham Manor, N.Y., were from Marmiro Stones, including warm-toned marble pavers and veneer, and travertine veneer that was quarried in Turkey. The project, installed by Scenic Landscaping of Haskell, N.J., included patios, walls, driveways, stairs, a courtyard and walkway, drainage, lighting and landscape.